MEMBERS of the Ballyhornan Residents Association gave the Downpatrick and County Down Railway a boost by volunteering last Saturday to help shift a backlog of work assocated with the Downpatrick expansion plans. This was part of the local heritage railway’s ongoing efforts to attract local people of all ages and skills to volunteer and help expand Irelands biggest functioning heritage railway. Councillor Cadogan Enright, who organised the event said: “The Ballyhornan team worked with experienced volunteers and we were able to shift a huge amount of work. 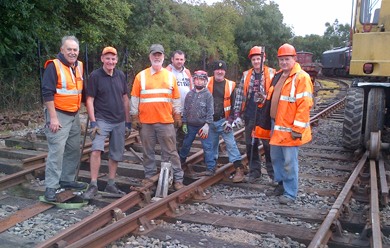 Photograph with David Crone Front Centre, Barry Mervyn back centre and Cllr Councillor Cadogan Enright, right, at a new track installation in the station yard with a group of volunteers. “Last Saturday was one of our most productive days, with the whole on the north side of the railway yard cleared, paving the way for building new rail lines into our new Locomotive Sheds.